While there is a plethora of books available that provide tips on Web design, most authors leave a significant gap between the theory and practice--a gap that is left up to the reader to fill. Homepage Usability: 50 Websites Deconstructed boldly steps into that gap with specific observations and suggestions backed with solid quantitative analysis. This book focuses only on home page design as the most important point of presence for any Web site. 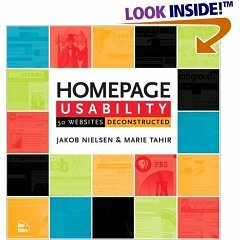 This definitive work is coauthored by Jakob Nielsen--the accepted industry expert in Web usability--and Marie Tahir, an expert in user profiling. Their collaboration has produced a guide of such rare practical benefit that Web designers will likely wear out their first copy scouring the pages to savor every last morsel of wisdom.